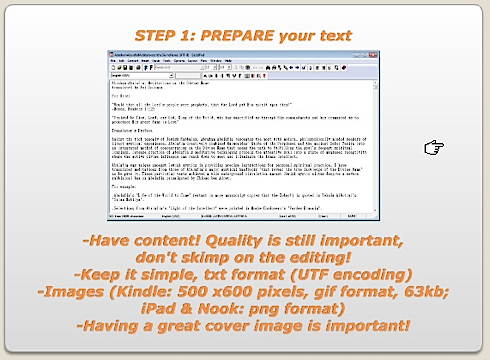 Avi Solomon offers his ultra short course on how to publish and sell your first ebook, in the form of a set of 16 slides on Slideshare. It’s a good orientation. Details are left to you. It assumes you have a “book” written and edited. Puts it into the standard epub format. Final result will be an ebook on Amazon’s kindle or the Nook (but not in the App Store).